Welcome to Today@WKU, the daily newsletter from WKU Public Affairs, for February 22, 2019. 4 students in WKU's Arabic program preparing for Qatar Debates: Four students in WKU’s Arabic language program will be traveling to Qatar in March to compete in the fifth International Universities Debating Championship. 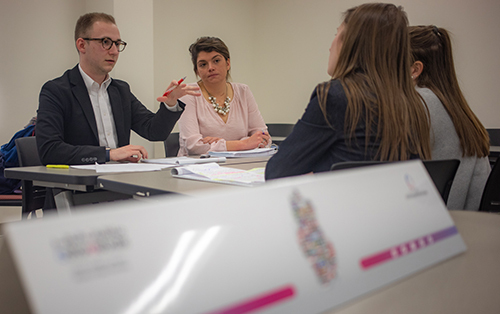 WKU will be one of five U.S. universities participating in the international competition, hosted by QatarDebate, brings together Arabic and non-Arabic speaking students from around the world to Doha, Qatar, for six days in mid-March. Entrepreneurship Students Win National Award: A student project from the Spring 2018 Small Business Analysis and Strategy class won first place in the Undergraduate Feasibility Analysis Division at the Small Business Institute Project of the Year Competition during the SBI Conference in Orlando, Florida, Feb. 14-16. Softball: Adjusted Hilltopper Classic Schedule Finalized: WKU Softball's schedule for the Hilltopper Classic has been finalized. The Red and White are slated to play two games on both Sunday and Monday. First pitch on Sunday will come at noon CT against Butler for WKU before taking the field again at 4 p.m. against Cleveland State. Head Coach Amy Tudor's squad will wrap up action on Monday with another contest against Cleveland State (2 p.m.) before closing the tournament against Indiana State (4 p.m.). Volleyball: WKU Announces 2019 Camp Schedule: With another memorable season in the record books, the WKU Volleyball staff is excited to announce that registration for the Lady Topper summer is now open. Camp sessions are scheduled for June 3-5 (Lil' Volley Topper Camp), June 10-12 (All Skills Camp & Elite Camp) and July 10-12 (High School Team Camp). Tennis: Three-Match Road Swing Up Next for WKU: WKU is set to play three road matches in just three days this weekend. The Lady Toppers head to NKU on Friday followed by Miami (OH) on Saturday and conclude on Sunday at Ball State. Bike4Alz: David Weafer has never ridden his bicycle more than five miles in one day. But that will change soon. Weafer, a 20-year-old psychology major at WKU, plans to ride his bicycle 3,600 miles from San Francisco, California, to Virginia Beach, Virginia, this summer in an effort to create awareness and raise money for Alzheimer's research. Stansbury back on sidelines after surgery: After missing four games due to a lingering back injury, one which he had surgery to address, WKU Men’s Basketball Head Coach Rick Stansbury returned to coaching practice on Wednesday, according to a release from the program. Stansbury is also expected to coach the Hilltoppers as they travel to Norfolk, Virginia, on Saturday for a rematch with Old Dominion to start Conference USA Bonus Play. 8 a.m.: High Impact Programs in the States National Conference. Downing Student Union. Contact Erin Holderman, (270) 745-4254. 7:30 p.m.: Concert: Back to the Classics by The Symphony at WKU. Van Meter Hall. Admission is $12; $6 for students/faculty. Contact Music, (270) 745-3751. 7:30 a.m.: The Gatton Academy Class of 2021 Interview Day. Various locations. Contact Zack Ryle, (270) 745-2971. 8 a.m.: Ogden College of Science and Engineering Preview Day. Ogden College Hall. Contact Ogden College, (270) 745-4449. 8 a.m.: 2019 Physics Olympics. Snell Hall, room 1108. Contact Richard Gelderman, (270) 745-6203. 9:30 a.m.: Winter Super Saturdays. Various campus locations. Contact Gifted Studies, (270) 745-6323. Noon: Triple T Farm Black Hereford Sale. L.D. Brown Agricultural Exposition Center. Contact Tim Tarter, (606) 305-2289. 1:30 p.m.: Explore WKU Preview Day. Downing Student Union. Contact Admissions, (270) 745-2551. High School Basketball: Boys’ Fourth Region Tournament. Diddle Arena. First-round games at 3 p.m. and 4:45 p.m. Contact Campus and Community Events, (270) 745-2497. 10 a.m.: WKU Softball: WKU Hilltopper Classic. Games at 10 a.m., noon, 2 p.m. and 4 p.m. WKU Softball Complex. Contact Athletic Communications, (270) 745-4298. Noon: WKU Baseball vs. Eastern Illinois, doubleheader. Nick Denes Field. Contact Athletic Communications, (270) 745-4298. 2 p.m.: Hardin Planetarium Show: Starry Tales for a Winter Night. Hardin Planetarium. Contact Planetarium, (270) 745-4044. 3 p.m.: WKU Choral Concert: The Road Home: Songs of Grace, Mercy and Peace. Van Meter Hall. Free admission; donations accepted. Contact Music, (270) 745-3751. 3 p.m.: Theatre Production: Aglaonike’s Tiger. Gordon Wilson Hall Lab Theatre. Admission is $16; $12 for students and seniors. Contact Theatre and Dance, (270) 745-5845. High School Basketball: Boys’ Fourth Region Tournament. Diddle Arena. First-round games at 6 p.m. and 7:45 p.m. Contact Campus and Community Events, (270) 745-2497. 3 p.m.: WKU Baseball vs. Eastern Illinois. Nick Denes Field. Contact Athletic Communications, (270) 745-4298.